Dessert for breakfast anyone? Well why not, once or twice a year? Here is an incredibly decadent breakfast for those really special occasions, like Christmas, a birthday or an anniversary. I always make a special breakfast on Christmas morning and this is the recipe I chose this year. 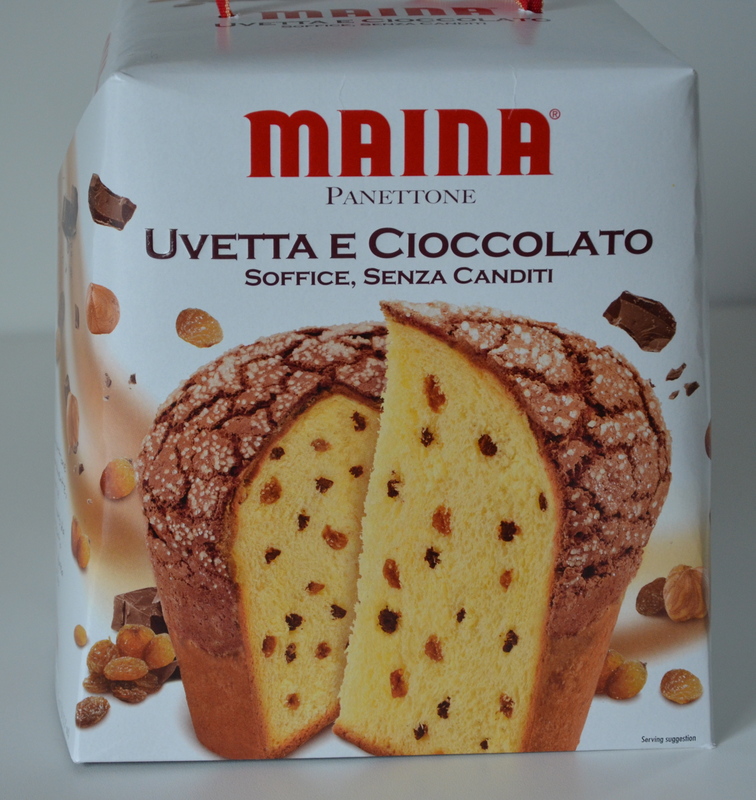 It takes an already super rich bread, panettone, and sky rockets it into a divine, creamy, mana-like dessert-breakfast. This recipe is an over-the-top treat! For those of you unfamiliar with panettone, it is a sweet, Italian bread that comes on the market at Christmas time (picture below). It is usually spiked with lots of dried fruits and nuts and/or chocolate. By mistake, I bought one with chocolate, and all I can say is WOW, not a bad mistake at all. My only regret is that we didn’t have guests for breakfast, because my husband and I had to eat the whole panettone!! (Darn!) We ate the leftovers for the next 2 mornings, just toasted and served with the Orange Cardamom Butter. I found the recipe in the December volume of “Taste” magazine, by the B.C. Liquor Distribution Branch. I will be thinking about this breakfast for the rest of the year and would definitely make it again!! I hope you enjoy it! In a small bowl, blend ingredients for butter together. Set aside at room temperature. In a mixing bowl, combine eggs, cream, sugar, zest and cardamom. Beat with an electric mixer until mixture becomes custard-like. Pour into a flat-bottomed bowl. Heat butter in a medium skillet. Lightly dip each side of the panettone slices into the egg mixture. Don’t soak the bread or it will become too soggy and begin to fall apart. Grill each side of the panettone in the skillet, 1 or 2 minutes or until golden brown. Add a bit more butter to the skillet each time you grill more bread. 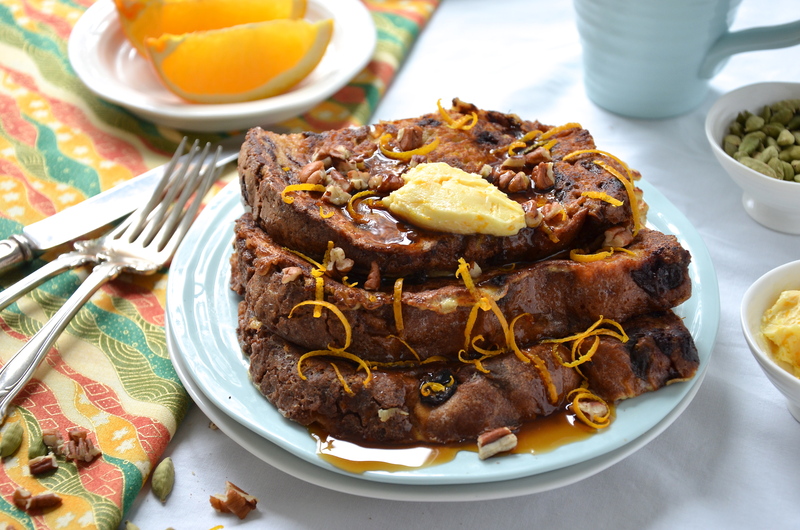 Serve with the orange, cardamom butter and some maple syrup. 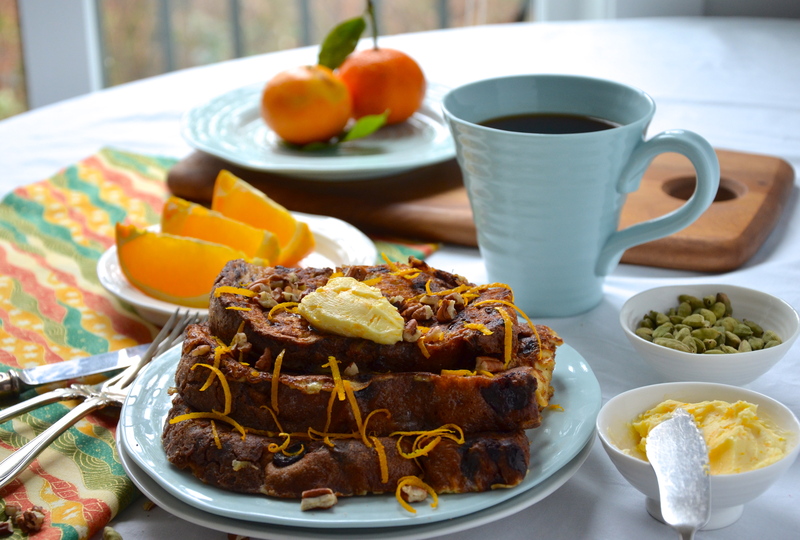 Garnish with some toasted pecans and a bit more orange zest, then dream about this decadent breakfast for the rest of the year! Enjoy! Please next time send me an invitation. I shall be happy to join you for the christmas breakfast. I’ve never eaten panettone but after reading through the instructions, I keep on hoping there is some left over panettone in my local store. I saw them a few weeks ago, I hope they are still there. I shall keep you posted. Have a wonderful week! Hey Liz, I will invite you next time! This is the kind of recipe you must share with all of your friends! I really hope you can still find some in the stores and don’t forget if you want that “special” kick, get the one with chocolate and fruit. Good-luck and please let me know what you think.